Earlier this month we warned you about the danger associated with cashing a check that appeared, to many consumers, to be a rebate check for their recent Snuggie purchase. Cashing the check enrolled the payee in Great Fun, a "20-year-old entertainment discount program offered by a third-party, Affinion," which provides discounts on shopping, dining and travel for a $150 annual fee. Despite the discounts that Great Fun offers and the explanatory note on the back of these incentive checks, many consumers were frustrated by the promotion and the high cost of membership. After reading the reactions in the comments at WalletPop and across the Web, Allstar Products Group, makers of the Snuggie, sent me a press release in an e-mail to let consumers know that it wasn't trying to pull a fast one by signing them up for a yearly membership with Great Fun. "It was not Allstar Products Group's intention for Great Fun's offer to in anyway mislead our customers and we want to ensure consumers fully understand the program. Indeed, prior to being presented to some of our customers, we were advised by Great Fun that the offer was in full compliance with state and federal laws." "The $8.25 check which accompanies the offer is not a rebate, nor was it ever represented as a rebate. It is an incentive for consumers who may be interested in enrolling in Great Fun." "We respect our customers and want to alleviate their concerns for any confusion this offer may have caused," said Ronald Steblea, executive vice president of Allstar Products Group. 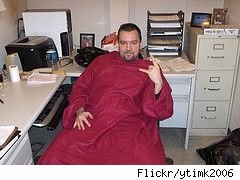 "We also want to assure consumers that this was a test program and that the Great Fun mailing was distributed to a very small sample of Snuggie customers who ordered a Snuggie blanket via the direct response television campaign. If anyone has any questions about the program, please contact customer service at 1-866-770-7622." Even though enrolling in a costly program by cashing a check with a contract on the back is legal, it doesn't mean it's the right way to treat your customers. It's good to see that Allstar Products Group noticed the confusion that this program caused consumers and is providing a point of contact to answer questions about the Great Fun promotion but only time will tell if they have really learned a lesson or are simply reacting to public outcry. In the meantime; don't go cashing any small unexpected checks that have a disclaimer on the back containing the words authorize, annual membership fee or automatically renewed unless you know what you're signing up for.